The Bulldog may be one of the most easily recognized dogs worldwide. Originally bred for the cruel sport of bull baiting, today the Bulldog has become a lovable companion. 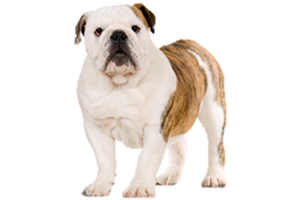 The history of the Bulldog begins in the 1600s, likely descending from the Asiatic Mastiff, when dogs were being used for bull and bear baiting. Dogs were bred specifically for this sport, and the characteristics of the Bulldog quickly became suited for it. When bull baiting became illegal in 1835 it seemed as if the breed would face extinction. Fortunately there were many breeders that fought to save the Bulldog and they began breeding to reduce its aggressive nature. The Bulldog that we know today no longer closely resembles its recent ancestors that would take on a bull with viciousness and no fear. They have been bred specifically for appearance, and as a result have a great number of medical problems. Several breeders have tried to recreate the original Old English Bulldog from the 1600s, but as of yet none are recognized. It is believed by some that the American Bulldog is actually a closer relative to the lost Bulldog of history. Is the Bulldog Right for You?